Entry limit is 500 Runners but please enter early as we expect to sell out & entry on the day is unlikely. Wheelchair entries are welcomed and will be given a short head start to ensure a clear run. Cost is £8.50, unaffiliated runners £10.50. Price includes chip timed race results, finishing prizes and free hot drink at the end of the race. It's hard to believe that this year will see the 12th running of the Harwich Runners Wix 5 - a great race for PBs due to a predominantly flat profile with a long, gradual descent for the final mile. 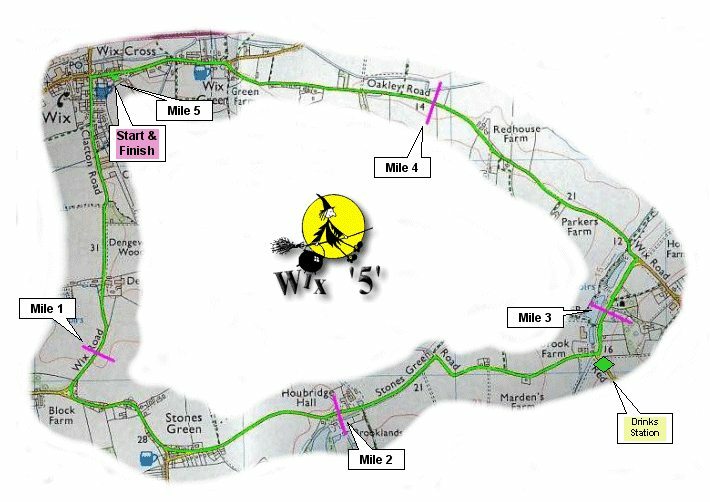 The race itself comprises a single anti-clockwise lap of a road course through the Essex villages of Wix, Stones Green and passing by Great Oakley. The race is fully marshalled and there is a drinks station at around the 3 mile point. Mile markers will be displayed. The Wix 5 will have a time limit of 1 HOUR 35 MINUTES.